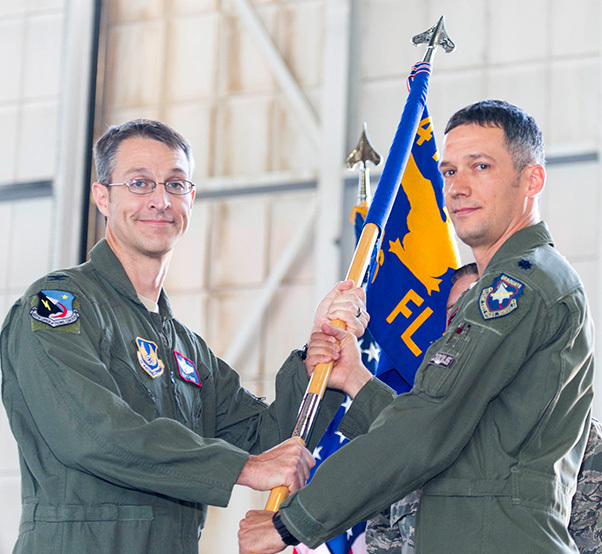 Col. Scott Cain (left), 412th Operations Group commander, hands the 416th Flight Test Squadron guidon to Lt. Col. Chris Keithley during a change of command ceremony June 24, 2016. Keithley takes over from Lt. Col. Darren Wees. Keithley comes to the 416th just down the road from the 461st Flight Test Squadron where he served as director of operations. He is a senior pilot with more than 2,000 flight hours in 35 different types of aircraft. 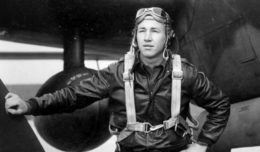 Keithley is also a distinguished graduate of the U.S. Air Force Test Pilot School here. The 416th FLTS oversees developmental test and evaluation at Edwards AFB for the F-16 Fighting Falcon. The squadron conducts program management, flight operations and test engineering for the Global Power Combined Test Force, overseeing the continuous modernization of the F-16. Additionally, the 416th FLTS provides training for other squadrons around the Air Force in high angle of attack departure recognition, avoidance and recoveries.